I submitted a proposal to the upcoming STEM conference which will be held in New Orleans immediately following the International Reading Association conference. This is officially called the STEM Forum & Expo is sponsored by NSTA (National Science Teachers Association), so I knew it was a longshot-- since I am not a "science" person. But we're so excited about the connections between science and poetry (thus, The Poetry Friday Anthology for Science), that we thought we'd give it a try. Well, we never heard from NSTA, so I figured it was not accepted. Oh well. But I thought I'd attend the conference anyway, since I'll already be in New Orleans (and I love that city). So I was browsing the conference schedule and as I scrolled through it, I saw MY NAME and my presentation listed! WHAT? We WERE accepted?! So, after a bit of scrambling Janet (Wong) and I were on board! In 30+ years of submitting proposals and planning presentations, that's a FIRST for me. But I'm still thrilled to get on the SCIENCE docket with our POETRY proposal! Linking poetry and science offers opportunities to develop both literacy and content knowledge with an interdisciplinary approach that integrates both NGSS and CCSS skills. Linking poetry and science offers opportunities to develop both literacy and science content knowledge with an interdisciplinary approach that integrates both NGSS and CCSS skills. Poetry provides cognitive transfer from concept to concept, deepens comprehension by providing vivid imagery and sensory language, and offers an emotional and experiential connection. In this session, participants will engage in poetry exploration activities that are standards-based, cross-curricular, and developmentally appropriate demonstrating how the Common Core State Standards intersect with the Next Generation Science Standards in grades K-5. Poetry’s brevity, conceptual focus, and rich vocabulary make it a natural teaching tool for connecting with science, particularly in celebrating National Poetry Month each April. Infusing poetry into the science curriculum can serve to jump-start or introduce a topic, present examples of terminology or concepts, provide closure that is concept-rich, or extend a science topic further. As we consider the STEM components, we can build comprehension and engagement by incorporating the art (A) of poetry throughout the curriculum, right alongside science, technology, engineering, and mathematics. We can explore how poetry might work alongside other texts and experiences to help students understand our "technology-rich and scientifically complex world” so critical in the Next Generation Science Standards (NGSS). We'll have books to give away, free stuff, and snacks! Come one, come all! One more science + poetry connection-- I'll be presenting at the upcoming conference of the International Reading Association in New Orleans on Mother's Day (May 11 at 11am). I have a fantastic panel of speakers and we're excited to talk about The Poetry Friday Anthology for Science and the cross-curricular potential of poetry of all kinds. Here's the lowdown. Linking reading and science offers opportunities to develop both comprehension skill and content knowledge and poetry is the perfect vehicle for capitalizing on those teachable moments of overlap and connection. Poetry provides cognitive transfer from concept to concept, deepens comprehension by providing vivid imagery and sensory language, and offers an emotional and experiential connection. In this session, participants will engage with poets themselves in poetry exploration activities that are skill-based, cross-curricular, sometimes bilingual, and developmentally appropriate demonstrating how reading intersects with the new Next Generation Science Standards in grades K-5. 1. Participants will be familiarized with the Next Generation Science Standards and how they intersect with developing reading in grades K-5. 2. Participants will be introduced to selected poets, poems, poetry books, and standards-based teaching strategies as well as relevant resources for integrating poetry into science instruction. 3. Participants will engage with poets themselves in examples of poetry exploration activities that are poem-specific, skill-based, cross-curricular, bilingual, and developmentally appropriate for each grade level (K-5), capitalizing on teachable moments for infusing literacy in science instruction and vice versa. Support for the multifaceted nature of sharing poetry is found in several reading theories and educational paradigms including Dowhower (1987), Rosenblatt (1978), Samuels (1979), and Schreiber (1980). More recently, Wilfong (2008) indicated that repeated reading of poetry improves fluency and attitudes toward reading. Through repeated immersion in poems, students increase sight word vocabulary and the ability to decode words quickly and accurately. In addition, the exposure to poetry allows students to use appropriate sentence phrasing, read punctuation markers, and read with greater ease. This fluent reading enables students to spend less time on decoding and have greater comprehension of the text (Pikulsi & Chard, 2005). According to Barbara Chatton (2010), poetry can also serve to integrate subject areas like science and reading by offering multiple opportunities for extending instruction. • Poetry can provide cognitive transfer from concept to concept. • Poetry deepens comprehension by providing another example of a concept. • Poetry provides more personal connections. The more connections we can provide between what children are learning in various areas of study, the deeper their learning will be. If poetry can be that vehicle for connecting books, skills, concepts, and information across the curriculum, we owe it to children to infuse poetry wherever we can. As Timothy V. Rasinski reminds us, despite the wonderful potential of poetry to explore language, it is one of the most often neglected components of the reading and language arts curriculum. Turning poetry into a shared experience can give poetry its rightful place in the reading-language arts curriculum providing practice for oral language development as well as a bridge to understanding content. Poetry often involves a high level of abstraction in language and ideas, and requires specific critical thinking skills and deeper comprehension. Infusing poetry across the curriculum can serve to jump-start or introduce a topic, present examples of terminology or concepts, provide closure that is concept-rich, or extend a topic further. Plus, there are many thematic poetry collections devoted to science-related subjects, such as animals, weather, seasons, space, dinosaurs, and geography, to name a few. Sharing science poetry titles in combination with a nonfiction work on the same topic, can model for students how information is presented in both prose or poetry. We can encourage children to think like a poet AND a scientist in carefully observing the world around them using all their senses, maintaining an avid curiosity about how things work, and gathering “big words” and key vocabulary in their reading and their writing. After laying the groundwork for the new Next Generation Science Standards, participants will hear from the poets themselves, as well as engage in poetry sharing that provide exposure to contemporary poems for children while integrating current principles of reading instruction, literacy building, cross-curricular connections, and science curriculum standards. This participatory session will incorporate print and digital media (including e-books) as well as audience engagement in strategies as they are demonstrated. Audience members will receive comprehensive bibliographies of books and recommended strategies. There will be snacks, giveaways and door prize books! Come join us if you're attending the conference! Recently I collaborated with friend, colleague and fellow blogger, Tricia Stohr-Hunt (of The Miss Rumphius Effect) on an article for ALA's Book Links magazine. We paired up to connect "Nonfiction Monday" and "Poetry Friday" to look at how we can link nonfiction and poetry to provide two perspectives on the same topic. There wasn't room for all our work in the April issue, so here is an extra bonus-- five more combinations of nonfiction and poetry books that treat the same topic, but in distinctly different ways, along with learning activities for classroom use on each topic. Enjoy! In the world of blogging about children’s literature (via Kidlitosphere.org and elsewhere), two major trends have emerged in the last decade: Nonfiction Monday and Poetry Friday. In each case, interested bloggers focus on one genre weekly in their posts and one of them volunteers to “round up” all the posts with links to each posting. Recently, Nonfiction Monday founder Anastasia Suen launched a group blog for corralling posts. Kelly Herold (of Big A, Little A) established the Poetry Friday tradition in 2006 and now Mary Lee Hahn at A Year of Reading manages the list of upcoming hosts. In each case, bloggers celebrate nonfiction and/or poetry by writing about nonfiction books and sharing them with children (on Monday) or sharing original poems, poetry book reviews and poetry news (on Friday). Many include book covers that are also shared on Pinterest. This provides an opportunity for readers to keep up with the latest in these two distinctive genres and learn about ways to connect with children’s lives and capitalize on teachable moments. Yes, of course we can share nonfiction and poetry on other days of the week too— but this is one way to make reading, responding to, and sharing of these genres intentional and not incidental. It can also be a model for classroom instruction, showcasing the latest nonfiction title in a Monday booktalk or incorporating poetry reading every Friday. Now let’s consider taking it one step further, linking these two genres together in creative ways. Pairing nonfiction and poetry may seem to be an unlikely partnership at first, but these two different genres can complement one another by showing children how writers approach the same topic in very different and distinctive ways. In addition, children will see that they can learn a lot of information from both a poem and a work of nonfiction. With the growing emphasis on comparing texts in the Common Core State Standards, linking these two genres offers a unique approach. You could begin by sharing the suggested nonfiction title and related activity on Monday and conclude with the suggested poetry title and activity on Friday, bookending your week with two genres linked by topic in connected, engaging ways. Here are a dozen pairs of related nonfiction and poetry books to get you started. Life in the Ocean: The Story of Oceanographer Sylvia Earle. By Claire A. Nivola. Illus. by author. 2012. 32p. Farrar/Frances Foster, $17.99 (9780374380687). Gr. K-3. This picture book biography of Sylvia Earle introduces readers to Earle's early life, her passion for the ocean, and her work in ocean exploration and advocacy. Nivola’s illustrations and text showcase Earle’s life work as well as the wonders of the ocean ecosystem. In the Classroom: On one double-page spread in the book (pp.12-13), Nivola highlights in text and illustration all the ways that Earle pushed the boundaries of ocean exploration, always trying to dive deeper. Ask students to think about something they have an interest in and want to investigate more deeply. Have them draw a series of pictures like those created by Nivola that show what their pursuit of this interest might look like. Invite them to write short captions for each one. Dare to Dream… Change the World. Edited by Jill Corcoran. 2012. San Diego, CA: Kane Miller. In this collection of biographical and inspirational poetry by thirty different poets, each pair of poems is inspired by someone whose actions made a difference, not only in their own lives, but also in the lives of people all over the world. Subjects form a culturally diverse mix ranging from Jonas Salk to Steven Spielberg, from Christa McAuliffe to Michelle Kwan, with brief descriptions of their lives included. In the Classroom: Share a few of the poems about inspirational people as another example of how information can be presented. Read aloud “My Polio Shot” by Janet Wong and “Jonas Salk Poem” by Elaine Magliaro while displaying the text of each poem. As students explore topics of special interest, drawing pictures, and writing captions to accompany those images, challenge them to turn their captions into free verse poems like those in Dare to Dream. Barnum’s Bones: How Barnum Brown Discovered the Most Famous Dinosaur in the World. By Tracey Fern. Illus. by Boris Kulikov. 2112. 40p. Farrar/Margaret Ferguson, $17.99 (9780374305161). Gr. 1-4. This picture book biography of Barnum Brown introduces readers to Brown, a young boy with a love for fossils who grew up to make extraordinary finds, including the first documented T. Rex skeleton, as a paleontologist for the American Museum of Natural History. In the Classroom: The American Museum of Natural History maintains archival copies of field notebooks from paleontological expeditions. What do you think Brown’s notebook might have look like? Visit the site (research.amnh.org/paleontology/notebooks/index.html) and take a look at some of Brown’s notebook entries. Field notebooks today look very different. Have students create their own field notebooks where they record observations, produce drawings/illustrations, determine relatedness among species (classification), and develop questions about the plants and animals they find in studying the schoolyard. The Robin Makes a Laughing Sound. By Sallie Wolf. 2010. Charlesbridge. Wolf has been a bird-watcher and journal keeper since childhood and this book reflects her careful observations, notes, sketches, paintings, and poems about her neighborhood birds, particularly robins. In the Classroom: Share a different kind of notebook, the chronological poems, notes, and paintings through the seasons that Wolf presents as she observes the robins and other birds in her area. Read aloud a few poems from the beginning, middle, and end of the book. Talk about how notebooks can form the basis of research, nonfiction writing, fiction writing or poetry writing. Select one entry from their student-created notebooks and write a collaborative poem together gleaned from those words. Balloons Over Broadway: The True Story of the Puppeteer of Macy’s Parade. By Melissa Sweet. Illus. by author. 2011. 40p. Houghton, $16.99 (9780547199450). Gr. K-2. This picture book biography of Tony Sarg introduces readers to the man who created floats and costumes for the first Macy’s day parade in 1924, and four years later developed the balloons that would fly over the parade. In the Classroom: The final endpapers of the book provide a copy of a1933 newspaper advertising the parade and Sarg’s balloons. Using pictures of recent parade balloons, ask students to write their own headline for the parade and describe the balloons using descriptive and/or figurative language. The World’s Greatest: Poems. By J. Patrick Lewis. Illus. by Keith Graves. 2008. San Francisco: Chronicle. Lewis showcases the weird and wonderful in two dozen poems about unusual record setters like the most cobras kissed, the biggest pumpkin, and the tallest scarecrow. 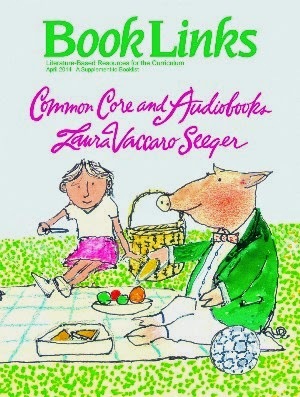 In the Classroom: Read aloud a sampling of poems such as “The Tallest Roller Coaster” and talk about how people can pursue all kinds of records and dreams, much like Tony Sarg’s work with puppets and parade balloons. Inflate a balloon and encourage students to write a dream or goal they have on a strip of paper and attach these to the balloon’s “tail” with string or yarn. Can We Save the Tiger? By. Martin Jenkins. Illus. by Vicky White. 2011. 56p. Candlewick, $16.99 (9780763649098). Gr. 3-6. Why are animals endangered or extinct? Through oil-and-pencil illustrations and highly informative text, readers learn about 28 different animals and how humans have adversely affected the environment and these species. In the Classroom: Vicky White earned a degree in natural history illustration and has traveled the world to draw and paint animals in the wild. This means her illustrations are more likely to be scientifically accurate. Select an illustration from the book and generate a list of details. What can you learn from the illustrations that is not expressly mentioned in the text? The Arrow Finds its Mark: A Book of Found Poems. Edited by Georgia Heard. Illus. by Antoine Guilloppe. 2012. New York: Macmillan. This collection highlights the form of “found” poetry—in which poets take existing words, phrases, and sentences from one source and then refashion them as poems. Heard includes 40 different found poems by a variety of contemporary poets based on all kinds or sources from book spines to menus to dictionaries to calendars. In the Classroom: Share a sampling of “found” poems based on newspaper articles and calendar text such as “Breaking, From Norway” by Naomi Shihab Nye, “Artist’s Advice” by Amy Ludwig VanDerwater, and “Song of the Earth” by Joyce Sidman. Talk about how each poet selected, arranged, and rearranged the words from one source to create something new—a found poem. Challenge students to work with a partner, choosing one of the 28 animals presented by Jenkins, and then rewrite a paragraph or page of text about their chosen animal as a “found” poem. Eat Like a Bear. By April Pulley Sayre. Illus. and by Steve Jenkins. 2013. 32p. Holt, $16.99 (9780805090390). Gr. PreK-3. This lyrical text follows a bear upon waking in April and eating through to fall such things as horsetails, dandelions, ants, trout, squirrel, moths, huckleberries and more. Full from months of eating, bear finally settles down to hibernate. In the Classroom: Sayre’s text is filled with synonyms for the action of finding and eating food. Reread the text and compile a list of these words with students. Discuss the differences among words like gnaw, tear, chomp, etc. Generate a list of the foods the bear ate and write some synonyms to further describe how she might do it. What’s for Dinner? Quirky, Squirmy Poems from the Animal World. By Katherine Hauth. 2011. Watertown: MA: Charlesbridge. More than two dozen different animals are described in poems focusing on what they eat, from the snake-eating hawk to the polar bear’s diet of seals, birds, and plants. Interesting endnotes for each animal complement the poems. In the Classroom: Read aloud the poem, “Eating Words” and talk about the labels used to categorize animals and what they eat: insectivores, carnivores, herbivores, and omnivores. Make a simple chart with four columns, one for each of these. Place the bear in the proper category and share additional poems (and endnotes), categorizing each animal by what it eats. Sylvia M. Vardell is a professor of children’s and young adult literature at Texas Woman’s University and the author of this Poetry for Children blog. and Bookish Ways in Math and Science.